Many gravel roads in western Oregon seem to be plagued with chronic potholes. In addition to causing excessive wear on the vehicle and tires, these depressions can cause unsafe driving conditions when drivers swerve to go around these annoyances. The good news is that steps can be taken to nearly eliminate the formation of these annoying obstructions. Most potholes begin at a slight depression in the road where water puddles. This creates weaker gravel surface that is more prone to deformation. With each passing tire this soft area gets deeper and wider, collecting more water until it forms a hole in the road surface. 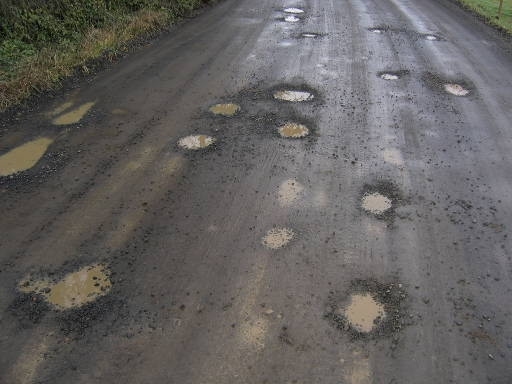 Since potholes are generally only partially full of water, the gravel immediately surrounding the pothole is able to drain into this hole, producing a dryer, stronger rim around the pothole that resists deformation. Diameter growth is therefore slow and potholes tend to remain as individual units, rather than merging together to form one big hole. The best way to avoid potholes is to prevent their formation from the start. Once the slightest depression forms, a pothole will begin to develop. Road maintenance should be performed before this occurs. There are several methods used to repair existing potholes, but they will all fail if the underlying problem is not addressed. One successful method used to eliminate potholes involves first filling the hole with good quality aggregate and then grading to increase the side-slope.